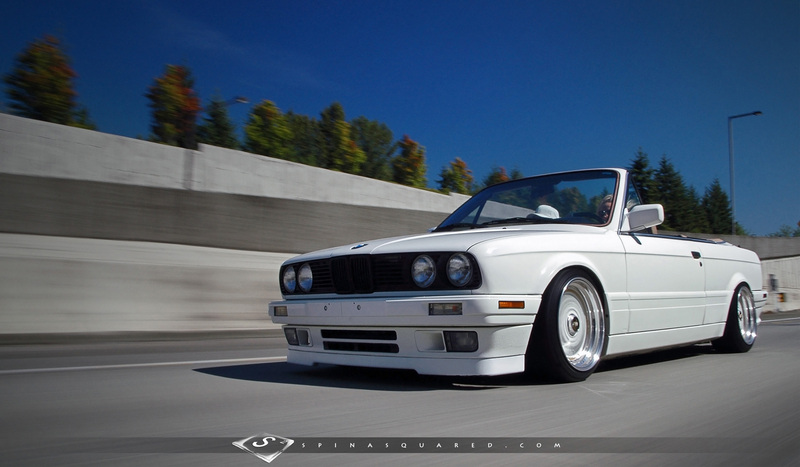 We caught up with our friends Rhett and Lindsay for a “take two” attempt at getting rolling shots of their 1990 BMW E30 325is ‘vert. Our first attempt was an impromptu roller taken after concluding that engagement photo session of the two we briefly mentioned last October. (Our first!) While she loved the original rolling shot, we promised a re-take after she had a chance to install an IS front lip spoiler that would complete the ground effects package featuring a plastic bumper conversion with MTech 2 pods, MTech 2 sideskirts, and Racing Dynamics rear apron. The new lip clearly makes a difference! We actually shot that one while attending the 2013 Leavenworth Drive, featured >>> here <<< in case you missed it.